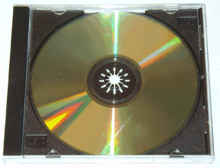 A compact disc in its jewel case. CD mastering differs from burning, as the pits and lands of a mastered CD are moulded into a CD blank, rather than being 'burn marks' in a dye layer (in CD-Rs) or areas with changed physical characteristics (in CD-RWs). In addition, CD burners write data sequentially, while a CD pressing plant 'writes' the entire disk in one physical stamping operation. All CDs are pressed from a digital data source, with the most common sources being low error-rate CD-Rs or files from an attached computer hard drive containing the finished data (e. g., music or computer data). Some CD pressing systems can use digital master tapes, either in Digital Audio Tape, Exabyte or Umatic formats. However such sources are suitable only for production of audio CDs due to error detection and correction issues. If the source is not a CD, the table of contents for the CD to be pressed must also be prepared and stored on the tape or hard drive. In all cases except CD-R sources, the tape must be uploaded to a media mastering system to create the TOC (Table Of Contents) for the CD. Creative processing of the mixed audio recordings often occurs in conventional premastering sessions. The nickname often used for this is "mastering," but the official name, as explained in Bob Katz book, Mastering Audio, edition 1, page 18, is premastering. After all, there still has to be the creation of another disc which has the premastered audio but which supplies the surface on which the metal master will be electroformed. So, there still needs to be the grandmother disc before the master stamper can be formed atop. During glass mastering, glass is used as a substrate to hold the CD master image while it is created and processed; hence the name. Glass substrates, noticeably larger than a CD, are round plates of glass approximately 240 mm in diameter and 6 mm thick. They often also have a small, steel hub on one side to facilitate handling. The substrates are created specially for CD mastering and one side is polished until it is extremely smooth. Even microscopic scratches in the glass will affect the quality of CDs pressed from the master image. The extra area on the substrate allows for easier handling of the glass master and reduces risk of damage to the pit and land structure when the "father" stamper is removed from the glass substrate. Photoresist mastering uses a light-sensitive material (a photoresist) to create the pits and lands on the CD master blank. The laser beam recorder uses a deep blue or ultraviolet laser to write the master. When exposed to the laser light, the photoresist undergoes a chemical reaction which either hardens it (in the case of negative photoresist) or to the contrary make sit more soluble (in the case of positive photoresist). The exposed area is then soaked in a developer solution which removes the exposed positive photoresist or the unexposed negative photoresist. Once the mastering is complete, the glass master is removed from the LBR and chemically 'developed'. Once developing is finished, the glass master is metalized to provide a surface for the stamper to be formed onto. It is then polished with lubrication and wiped down. Electroforming occurs in "Matrix", the name used for the electroforming process area in many plants; it is also a class 100 (ISO 5) or better clean room. The data (music, computer data, etc.) on the metalised glass master is extremely easy to damage and must be transferred to a tougher form for use in the injection moulding equipment which actually produces the end-product optical disks. The current must start off quite low as the metallised layer is too thin to take large currents, and is increased steadily. As the thickness of the nickel on the glass "mistress" increases, the current can be increased. The full electroforming current density is very high with the full thickness of usually 0.3 mm taking approximately one hour. The part is removed from the tank and the metal layer carefully separated from the glass substrate. If plating occurs, the process must be begun anew, from the glass mastering phase. The metal part, now called a "father", has the desired data as a series of bumps rather than pits. The injection moulding process works better by flowing around high points rather than into pits on the metal surface. The father is washed with deionised water and other chemicals such as ammonical hydrogen peroxide, sodium hydroxide or acetone to remove all trace of resist or other contaminants. The glass master can be sent for reclamation, cleaning and checking before reuse. If defects are detected, it will be discarded or repolished recycled. Once cleaned of any loose nickel and resist, the father surface is washed and the passivated, either electrically or chemically, which allows the next plated layer to separate from the father. This layer is an atomic layer of absorbed oxygen that does not alter the physical surface. The father is clamped back into a frame and returned to the plating tank. This time the metal part that is grown is the mirror image of the father and is called a "mother"; as this is now pits, it cannot be used for moulding. A father, mother, and a collection of stampers (sometimes called "sons") are known collectively as a "family". Fathers and mothers are the same size as a glass substrate, typically 300 μm in thickness. Stampers do not require the extra space around the outside of the program area and they are punched to remove the excess nickel from outside and inside the information area in order to fit the mould of the injection moulding machine (IMM). The physical dimensions of the mould vary depending of the injection tooling being used. CD moulding machines are specifically designed high temperature polycarbonate injection moulders. They have an average throughput of 550-900 discs per hour, per moulding line. Clear polycarbonate pellets are first dried at around 130 degrees Celsius for three hours (nominal; this depends on which optical grade resin is in use) and are fed via vacuum transport into one end of the injection moulder's barrel (i.e., the feed throat) and are moved to the injection chamber via a large screw inside the barrel. The barrel, wrapped with heater bands ranging in temperature from ca 210 to 320 degrees Celsius melts the polycarbonate. When the mould is closed the screw moves forward to inject molten plastic into the mould cavity. When the mould is full, cool water running through mould halves, outside the cavity, cools the plastic so it somewhat solidifies. The entire process from the mould closing, injection and opening again takes approximately 3 to 5 seconds. The moulded "disc" (referred to as a 'green' disc, lacking final processing) is removed from the mould by vacuum handling; high-speed robot arms with vacuum suction caps. They are moved onto the finishing line infeed conveyor, or cooling station, in preparation for metallisation. At this point the discs are clear and contain all the digital information desired; however they cannot be played because there is no reflective layer. The discs pass, one at a time, into the metaliser, a small chamber at approximately 10−3 Torr (130 mPa) vacuum. The process is called 'sputtering'. The metaliser contains a metal "target" — almost always an alloy of (mostly) aluminium and small amounts of other metals. There is a load-lock system (similar to an airlock) so the process chamber can be kept at high vacuum as the discs are exchanged. When the disc is rotated into the processing position by a swivel arm in the vacuum chamber, a small dose of argon gas is injected into the process chamber and a 700 volt DC electric current at up to 20 kW is applied to the target. This produces a plasma from the target, and the plasma vapor is deposited onto the disc; it is an anode - cathode transfer. The metal coats the data side of the disc (upper surface), covering the pit and lands. This metal layer is the reflective surface which can be seen on the reverse (non label side) of a CD. This thin layer of metal is subject to corrosion from various contaminants and so is protected by a thin layer of lacquer. For quality control, both the stamper and the moulded discs are tested before a production run. Samples of the disc (test pressings) are taken during long production runs and tested for quality consistency. Pressed discs are analyzed on a signal analysis machine. The metal stamper can also be tested on a signal analysis machine which has been specially adapted (larger diameter, more fragile, ...). The machine will "play" the disc or stamper and measure various physical and electrical parameters. Errors can be introduced at every step of production, but the moulding process is the least subject to adjustment. Sources of errors are more readily identified and compensated for during mastering. If the errors are too severe then the stamper is rejected and a replacement installed. An experienced machine operator can interpret the report from the analysis system and optimise the moulding process to make a disc that meets the required Rainbow Book specification (e.g. Red Book for Audio from the Rainbow Books series). If no defects are found, the CD continues to printing so a label can be screen or offset printed on the top surface of the disc. Thereafter, disks are counted, packaged, and shipped. 1 2 3 "What is a glass master?". Wizbit Internet Services. Retrieved 2010-05-08.